During the 2018 midterms, already blue Illinois moved further on the color spectrum towards indigo—thanks, in part, to an uptick in the share of votes coming from women for women. National League of Women Voters members urging women to vote in 1924. 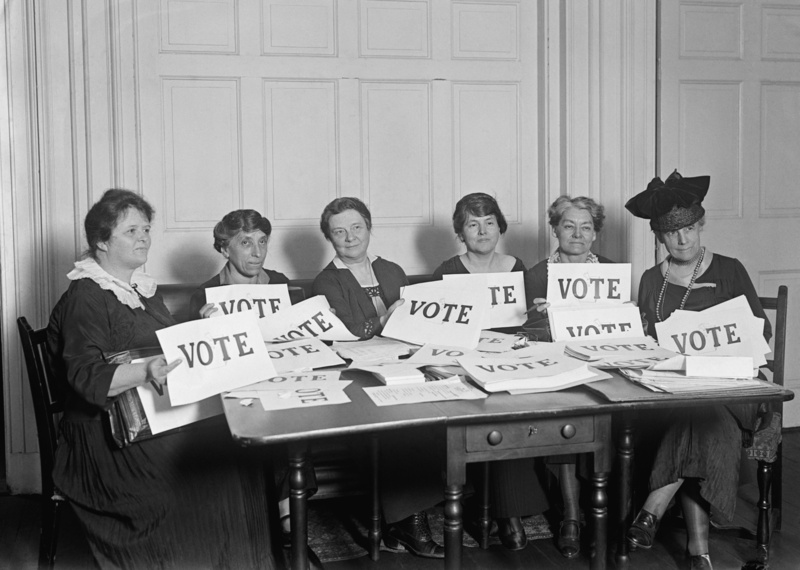 Millions of women across the country voted in 1920, but at a lower percentage than men. 100 years later, women helped propel a so-called "blue wave," including in Illinois. Shutterstock Image. Add several drops of dye to a can of dark paint, and the change may not be readily apparent. That tinting process is analogous to what happened in Illinois during the 2018 midterms -- as an already blue state shifted further on the color spectrum towards indigo -- thanks, in part, to an uptick in the share of votes coming from women for women with traditionally Republican-represented DuPage County leading the charge. It’s a milder example of what happened nationally, where politically active women (and young people) caused more than 335 congressional districts across the country to vote in a more Democratic fashion than they had in 2016. This turnout flipped the House of Representatives into Democrats hands, resulting in a body that is more diverse, more female, and more progressive than ever before. The same can be said of many state legislatures, including Illinois, where seats in reliably Republican pockets of the state, like DuPage County, will now be represented by more Democrats in Springfield this term in decades. Yet here, once again, it’s a change that isn’t as easily discernible, due to the General Assembly’s traditionally higher than average overall percentage of women, and members of color. 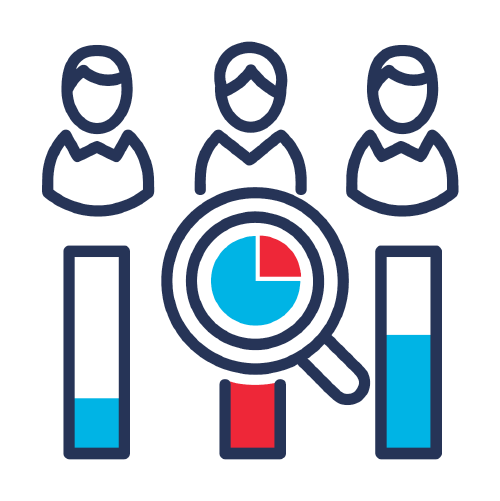 A new analysis by the Center for Illinois Politics of state election data finds 54 percent of voters who turned out across the state in 2018 were women, up from 52 percent in 2014 and 2016, a difference of about 100,000 women. When more votes in a county came from women, the county tended to vote more Democratic. Across the state, where female voter share was at or above the statewide average, flips from Republican to Democratic seats tended to be the most dramatic. That includes Cook County, as well as the suburban collar counties of DuPage, Cook, Kane and Lake Counties, as well as in central Illinois’ Sangamon County and Metro East’s St. Clair County. In the 2018 midterms, the percentage of Cook County voters who voted Democratic was 75 percent, and its percentage of registered females voting was 55 percent. In traditionally Republican DuPage County, 51 percent voted Democratic, and 53 percent of females voted. Lake County saw 54 percent of residents vote Democratic, and 53 percent of registered women vote. Downstate, Sangamon County saw 48 percent of voters vote Democrat, and 53 percent of women vote. In in St. Clair County, 57 percent voted Democratic, and 54 percent of women turned out. Looking at DuPage County, that 51 percent of voters casting ballots for Democrats skyrocketed, up from just 11.5 percent in 1990. In the 14th Congressional District, Democrat Lauren Underwood of Naperville has been touted as the embodiment of Illinois’ “Year of the Woman” after defeating incumbent Randy Hultgren of Plano. The 14th's female share of the vote was 52 percent. In the 6th Congressional District, represented by a Republican since 1975, Republican incumbent Peter Roskam of Wheaton lost in a contentious, high-profile race to Democrat Sean Casten of Downers Grove. There, 52 percent of voters in the contest were female. Gains for women also occurred in this traditionally Republican, white male bastion included Illinois’ 81st House District, where Democrat Anne Stava-Murray beat incumbent Republican David Olsen of Downers Grove by 930 votes. This was a district that had been safely Republican since the 2011 redistricting process. In the 21st state Senate District, incumbent GOP Sen. Michael Connelly conceded to Democrat Lauren Ellman of Naperville. The Senate Democratic Victory Fund invested more than $1 million in the effort to defeat Connelly, who served in the House since 2009 and Senate since 2013. There, 55 percent of the voters who turned out were female. 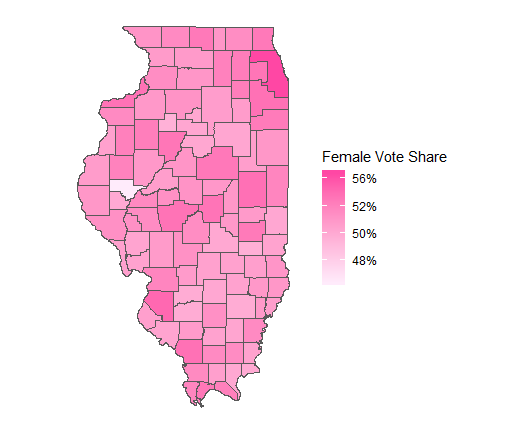 The Illinois General Assembly only saw a net increase of one new female legislator. Still, Illinois has a much higher than average percentage of female legislators - 37 percent - compared to the national average of 24.5 percent. “The comparison to (nationwide trends) reminds us that Illinois typically votes more Democratic than the rest of the country,” Mooney said. While almost 50 percent of the House Democratic caucus is female, women make up only 20 percent of the House GOP caucus. In the Senate, there are just two Republican women, with Democratic women representing 45 percent of the party’s caucus in the chamber. “This differential appeal of the parties to men and women has been documented in voting studies in the U.S., and the stark difference between female representation in the parties has been seen increasingly in Congress since 1994,” Mooney concluded.